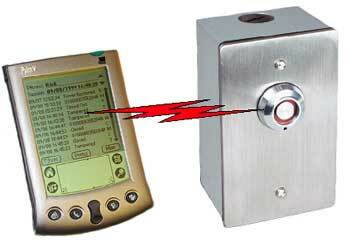 --a programmable access control system designed for a wide variety of installations. 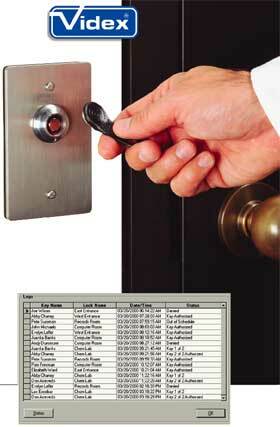 TouchAccess 300 consists of two components: an intelligent controller and the touch key reader. They can both be installed in a single-gang electrical box, or the intelligent controller can be separated and installed in a remote location for added security. TouchAccess 300 can be installed as a stand-alone system using a single output line, or the optional output lines can be used to integrate into other devices such as alarms, cameras, or lights. Touch keys are small electronic tags with a unique ID. TouchAccess 300 stores a list of authorized keys with their access privileges. The control panel also records authorized openings, tamper events, and denied entry events. The information stored in TouchAccess 300 is transferred via an infrared connection to a Palm handheld organizer, and is then sent to the PC using Videx AuditLink 300 software.